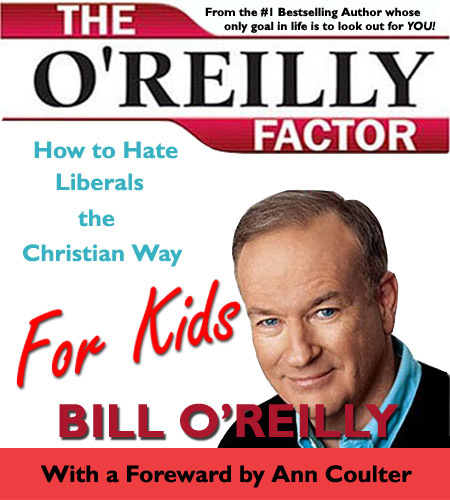 If you’re looking for an educational Holiday gift for the wee ones, look no further than a book written by America’s own self proclaimed culture warrior, Bill O’Reilly. Yes Fox New’s biggest blowhard, who’s only goal in life is to look out for you, has written many a book in his day, but this one speaks to the kids and sets them on the right path; the far right path. Look for it at your nearest book store in the bargain bin. Neocon talk show host, Bill O'Reilly, whose only goal in life is to look out for you, recently wrote a book to brainwash, er...make that, inform today's youth and help them navigate the mine fields of the evil 'liberal media'.